LastPass is down. Such an outage of a mission-critical IT component can have severe consequences. While LastPass team is coping with the problem, we take our time to look into reliability of cloud technologies. Here we talk about LastPass backup strategies and general questions of policies and reliability of cloud technologies. For about six month now the company I am working at is using LastPass Enterprise for passwords management. It has been a great experience but for a few moments. 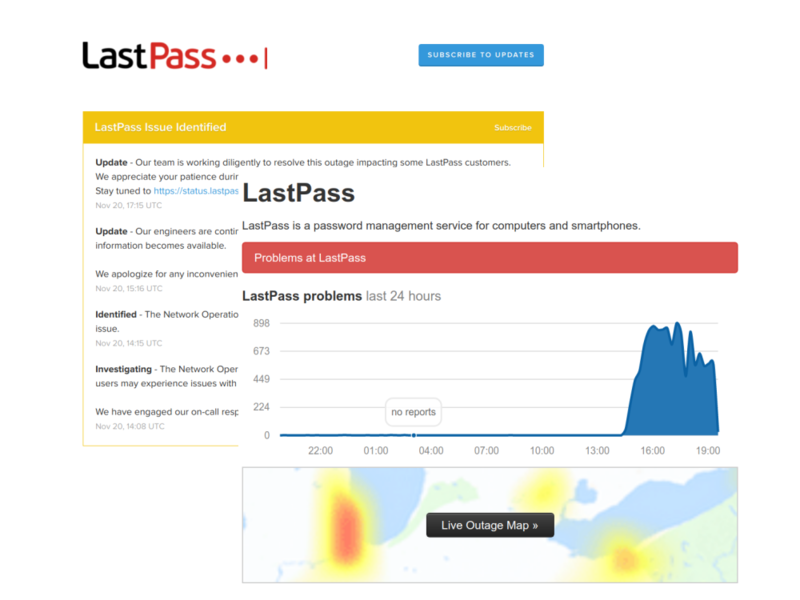 And today it is one of these moments: we are facing an outage of LastPass for the second time. It depends on what you have used the LastPass for. In the easiest case, your session is still active on some website and you can keep using it, no password is required. Let’s go to a more complex case. Once LastPass is used to manage passwords to a technology which you posses and can control without a password – it is alright as well. You could reset the password, store it on your off-line password manager and go ahead using the system, the access is granted. Same with the resources you do not own but have a chance to reset a password for. Let’s get to an even more complex case. Imagine, you have stored a password, or even better, a cryptographic key in the LastPass and the technology to which this key is used does not allow you to restore the password. Well.. then you might be in trouble actually. Similarly when you stored in secure notes some important non-credentials-like information. In such a case multiplied by an outage of LastPass servers you might really want to have a backup of your LastPass account locally. LastPass provides you with a chance to back up everything through an export. The provided format is either CSV or a LastPass encrypted format. The encrypted format is likely the same CSV but encrypted on a key with PBKDF algorithm. It is a proprietary format, so likely, to have more flexibility when the LastPass is down, you would have to go for the CSV option. The CSV unfortunately does not store all of your enterprise information. Passwords and their associations with folders are stored, but the users, the groups, permissions, ploicies - all the enterprise configuration is not backed up. Another problem with the CSV is that it is a clear text file with all your passwords! Simply storing such a backup somewhere on a hot drive is a bad idea. Encrypting it should be a default choice. I would use Veracrypt and a good passphrase for it. A really good one. Something similarly good as your Master password in LastPass. In the enterprise environment you will definitely have users who will not back up their LastPass account. And it is even maybe for good. Very likely if you’d ask to backup, you’ll get plain text backups stored on multiple machines. What could be done to improve the enterprise backup effect? First, there is a chance to set up a policy in the LastPass to share implicitly with the LastPass Enterprise Administrator all the shared with someone passwords. This policy will include the shared passwords in the administrator’s back up as well. LastPass recommended this policy in their webinars. I am forwarding it to you. Second, you would need to rely that you will have a backup of the administrator password to a given resource. In this case you would be able to reset the users’ access to the resource itself directly. Sharing the password gets complicated however, once your enterprise cloud password wallet is down. Obviously the passwords to third-party resources which are not shared are getting inaccessible still. Good if it is “just” an outage. Much worse if the user or users willingly or by using a compromised machine have actually deleted the passwords irreversibly. Actually, such class of problems is typical for cloud services. Loss of data is very much possible there. Please, consider the erroneous deletion case. We rely on cloud services data loss protection. Sometimes too much. Organizations are bought through nice marketing into thinking that there is no need for administration in the cloud case at all. Unlikely. Going for the policies part, when choosing a cloud provider, I would pay attention if they allow for off-line and local backup of all the account’s data. The ability to restore this data from the offline backup timely and easily is also a crucially important and is not self-evident feature. Once an off-lineable technology is preferred and selected, a regular reliable backup strategy should be considered. Maybe you know the 3-2-1 rule for backups? The images on this page are copy-right protected. All rights are reserved. You are not allowed to use them without prior written permission for any purpose including but not limited to saving them, downloading them, sharing them, printing them, distributing them.